To get the h-stab tip to a fuller shape, I traced out the shape of the elevator fairing and the h-stab airfoil onto some 1/8 inch plywood and cut out some bulk heads to insert in the tip. When I insert these in the tip it gets pretty close to the proper shape. With the bulkheads inserted I did the final trimming on the tip to get the specified 1/8" space between the tip and the elevator fairing. 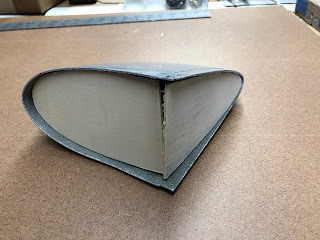 Chapter 12 specifies that you layup 2 layers of (9 oz. bidirectional) fiberglass and apply it to the back of the tip fairing. 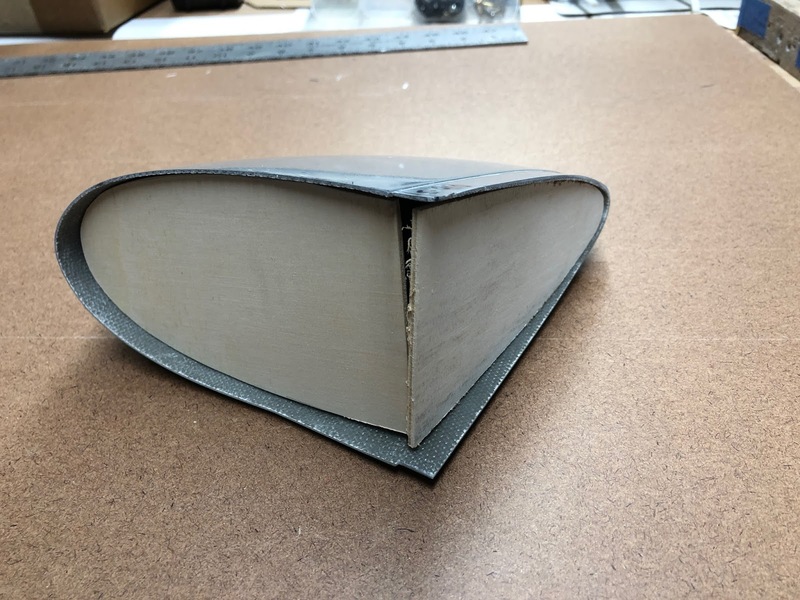 This will not be stiff enough to hold the shape, so I decided to build a fiberglass/balsa sandwich panel which should be close to the same weight, but much stiffer. I made a mold by bending a sheet of .040 aluminum to match the edge of the tip. I bent both ends of the aluminum so I could layup 2 parts at once. Then I cut out 3 layers of fiberglass and some 1/8 inch light balsa. Then I waxed the aluminum and a top sheet of mylar using mold wax. 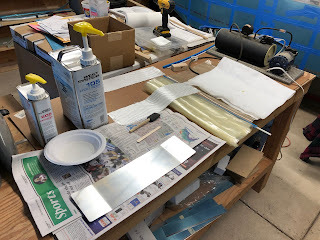 I laid up 2 layers of fiberglass on the aluminum mold then added the balsa sheet and then 1 more layer of fiberglass on top of the balsa. Then I put a mylar skin on top of the last fiberglass layer and closed the whole assembly in wax paper and a breather cloth. 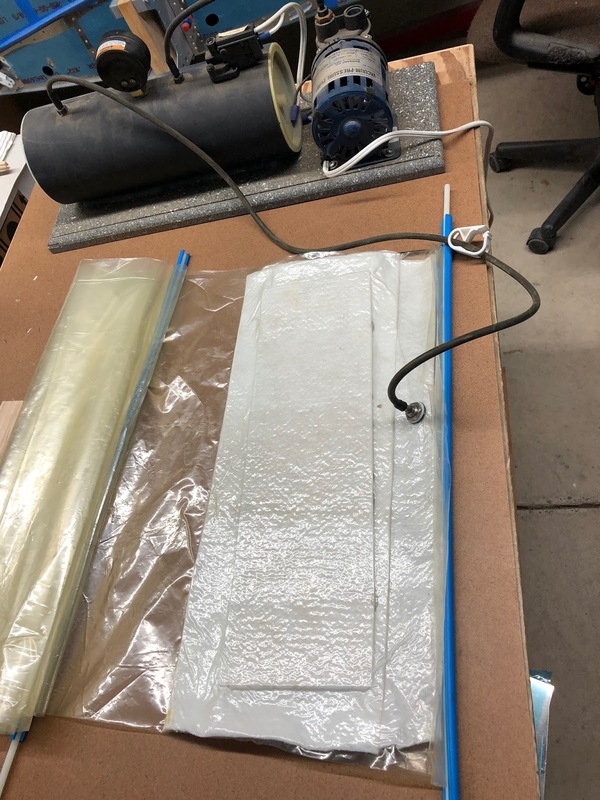 I then inserted the layup into a vacuum bag and pulled 9 inches of pressure using my vacuum pump from ACP (note: this is probably overkill for this project and an open layup would work just fine, but I already had the equipment on hand from previous R/C glider wing projects).